Produce that can be bin tipper can be used: – Apples, pears, quinces, carrots etc. can all be tipped with the GKE bin tipper. 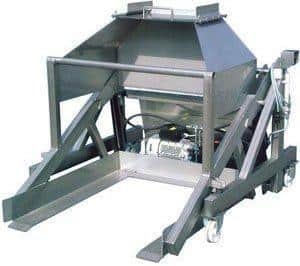 It is the ideal machine to load a Kreuzmayr fruit washer/elevator with the minimum of time and wastage. 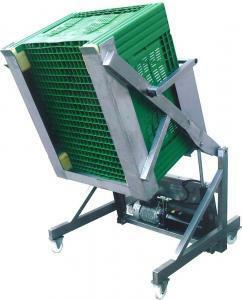 Orchard bins of fruit or vegetables are fork lifted into the GKE’s sturdy lifting frame. The operator can then tilt and empty the pallet box into a washer/elevator or onto a sorting table by simply pushing the start switch. The GKE’s hydraulic lifting mechanism does the rest. A sliding gate regulates the flow of produce out of the bin to ensure an even flow. Remo and Nathan, thank you for your patience helping troubleshoot our elevator during the holidays! I was quite surprised how fast we got the New motor all the way from Austria,that got us up and running! I also appreciated how you always got back to me right away even though we were in different time zones. Thanks again! I have never had better customer service than what I have when working with Remo - he's fantastic. I have recommended him to several people and will continue to do so. Thank you for all your assistance! Remo is the man. We had a mishap when unloading the machinery and spare parts were on site a few days later. I'm quite happy with everything really. You run a tight ship!